Do you want to have your faith in melodic hard rock restored? Well this might very well do the trick. In Faith are a UK trio that features guitarist Tony Marshall (Contagious / Pride / Vaughn), drummer Pete Newdeck (Eden’s Curse / Tainted Nation) and singer / bassist Pete Godfrey. Over the course of a two year period the trio have put together a striking slab of melodic hard rock that harks back to the classic late 80’s / early 90’s period all genre fans know and love. You could quite happily file this alongside your Harem Scarem, Winger, Von Groove and Firehouse albums. A quite stunning combination of hard edged riffs, souring guitars and massive walls of harmony vocals this hits the spot. It’s easily the best thing I’ve heard since H.E.A.T. released ‘Address The Nation’. Opener ‘Radio’ sets the scene, a blazing hard rocker with razor sharp guitars from Marshall and guest Pat Heath (Furyon) and more vocals than a Def Leppard record. Lyrically / sonically the radio motif is well served by the clever use of odd lyrics from the genres biggest hits .It’s hard to believe that tracks from 2014 can match the classics of the past, that we’ve lived with all these years, but the glorious ‘Does It Feel like Love’ is sumptuous AOR with the vocals of Pete Godfrey driving a steller chorus and the solo is perfectly positioned / played. Melodic rock doesn’t get better than this. The album really does have highlights a plenty with ‘Where I Wanna Be’ a future classic in the making as the chorus drags you in due to the clever vocal phrasing and the ever present, and very welcome, backing vocals. The song construction is worthy of mention with the upfront bass and the intricate guitar figures that underlie the song hugely effective. A solo from Brooke St. James of Tyketto fame rounds things off. Elsewhere ‘If That’s What Love Means’ and ‘A Million Ways’ feature tour-de-force vocal performances from Godfrey and complex vocal arrangements while the hard rockers amongst you are well served by the likes of ‘All Or Nothing’ and ‘Addicted’ with its blazing Chris Green (Rubicon Cross) solo. The acoustic based ‘Leave Me Now’ presents another change of pace; it’s a strong song and would be a pop hit, no question, in the right hands. To sum up I doubt you will hear a better album in the genre this year. 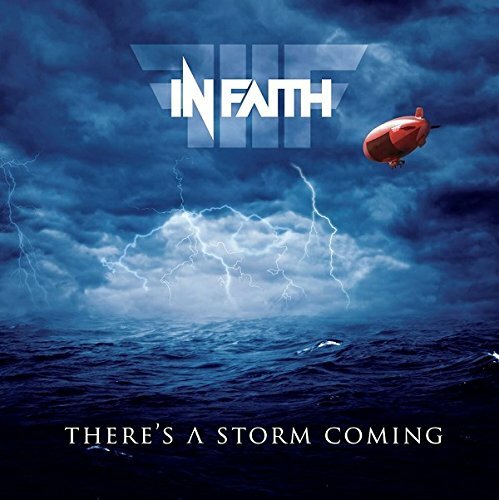 In Faith deserve to be congratulated on ‘There’s A Storm Coming’ which they obviously took time to get right and they really did get it right.